Belleville's most reliable car towing service providers. Our tow truck services include car towing services, flatbed towing, vehicle recovery & wrecker tow truck in Belleville. For Fast and Reliable Towing Service in Belleville and Quinte West Call Our 24 hour Emergency Roadside Service Team! 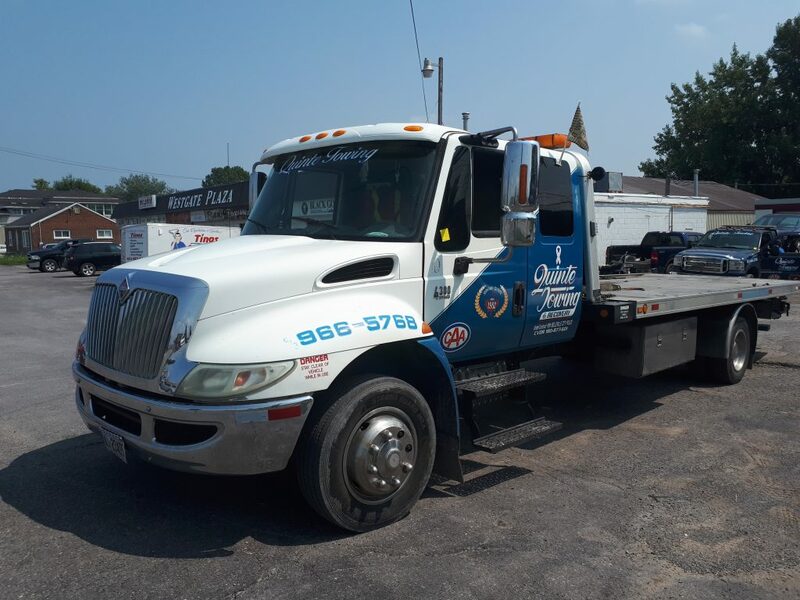 Quinte Towing and Recovery are reliable tow truck service specialists, and we pride ourselves on delivering professional roadside assistant services to the Belville community and beyond. For over 35 years, we’ve promptly come to the rescue of motorists with our professional vehicle recovery services, no matter how far they are or urgent the situation is. It’s our ability to always be there for our customers that makes us stand out from the rest. As a forward-thinking family-owned business, we understand the value of providing quality customer service. We’ve built our reputation by providing this to every customer and being able to recover vehicles from extraordinary circumstances. It means that once a person becomes a customer, they usually remain a customer for life. Our well-maintained specialised fleet of tow trucks allow us to offer comprehensive 24-hour services. We also provide conveniently located and secure storage facilities that have been built to suit all vehicles and give you peace of mind. Have you been involved in an accident or has your car broken down? We offer flatbed towing services using specialised flatbed tow trucks. Our qualified team of technicians will take extra care in ensuring your vehicle is quickly and efficiently removed from the scene and taken to your location of choice or our storage facility. We have a fleet of medium-duty trucks equipped with modern technology, ready to handle all your towing needs. When you’re dealing with a utility truck, trailer, motorhome, camper vehicle or delivery truck that needs towing, we’re more than happy to assist. Are you stuck in the middle of nowhere and can’t leave your ‘baby’ alone? Then call us up and request our towing services. We’ve been doing this for years, so no need to worry about us accidentally damaging your car. We’re towing experts! Are you tired of paying exorbitant prices for wrecker services that fail to live up to your expectations? Then we’re your best option. We have a well-maintained fleet of wrecker tow trucks and an experienced team to complete any job promptly and cost-effectively. At Quinte Towing and Recovery, your satisfaction is our number one concern, so we urge you to leave all your towing worries in our competent hands. We offer 24-hour emergency services, and our dedicated team is available to assist you with all your queries between office hours. If you are interested in our services or require more information, please feel free to contact us or visit our website. Prompt, friendly and efficient service. Thank you!